Extremely Displayable Flying TRUE Odontochile- RARE! Here is a very attractive trilobite fossil. This is Odontochile sp. from the Devonian of Morocco. This striking specimen was prepared in the EXTINCTIONS Prep Lab. This strange trilobite differs from the more common Zlichovaspis rugosa by having a rounded front cephalon and shorter tailspine. It also differs from Odontochile spinifera by having a smooth, not pustulose, exoskeleton. This large trilobite is essentially prone and nicely articulated. The thick shell exoskeleton displays very fine detail. The long, sweeping genal spines have been prepared free-standing, making the bug appear as though it is "flying". 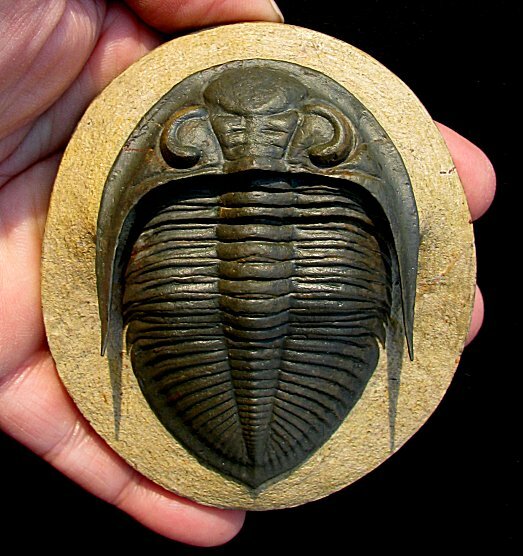 The trilobite has beautiful, natural brown color that contrasts well with the lighter-colored matrix. The trilobite displays beautifully on the sculpted plate of limestone. This is a top quality specimen of this extremely scarce species of Odontochile.